We strive to educate all students in an environment that fosters a sense of belonging and community while providing engaging opportunities for learning. We strongly believe in inclusive education that values and respects learning and social differences. We encourage our dedicated teachers and support staff to use their knowledge and skills to create democratic learning communities where all children are enabled to reach high academic and social-emotional expectations. The Special Education and Pupil Personnel Departments of the Ridgefield Public Schools provide a continuum of services to the students of the Ridgefield community. Our staff serves students preschool through age 21 as determined by the Planning and Placement Team (PPT). Services may be provided by special education teachers, speech and language pathologists, occupational therapists, physical therapists, school psychologists, guidance counselors, social workers, and nurses. 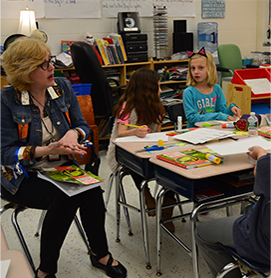 The education team, including general and special education administrators and staff, works collaboratively with families in meeting the needs of the students. The provision of services is determined based on the laws, regulations, and criteria set by the federal government, the Connecticut State Department of Education, and the Connecticut Bureau of Special Education.